Nothing says Valentine’s day like Red Velvet Cake. 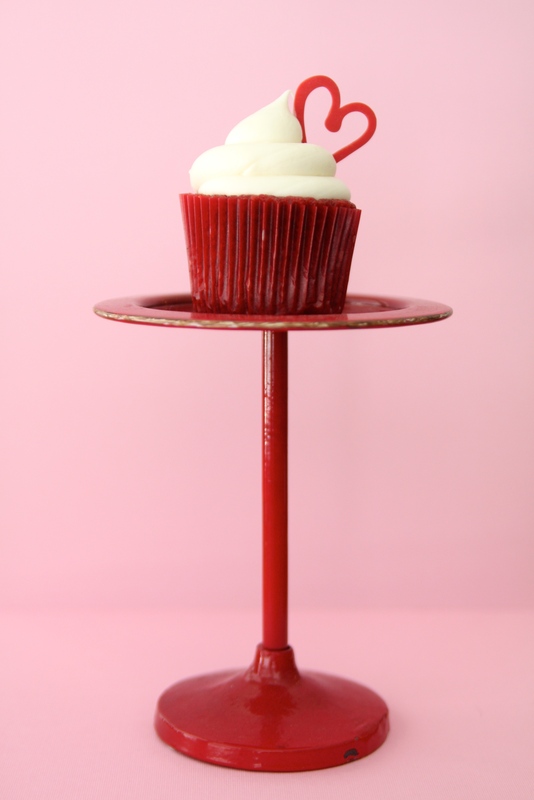 If you are planning on doing any Valentine’s Day baking, these classic cupcakes are a must. You can count on more Valentine’s goodness in the days ahead! The cake recipe is from Bakerella. Preheat oven to 350 degrees. Line 24 standard muffin cups with cupcake liners. Pour into prepared muffin cups and then drop the pans on the counter a few times to release any air bubbles.Bake for about 20 minutes or until a toothpick inserted comes out clean. Cool completely before frosting. For the hearts, melt red wafer candies over low heat. Once melted transfer to a piping bag. Pipe out hearts on wax paper. Once set, remove from wax paper and place on top of cupcakes. Yum! What all are you making for our VDAY themed small groups? I think I will have these cupcakes. How about you, what are you making? I can’t wait to see/taste it whatever it is!! !